Google Alerts sent me to this really great review of The Wonderland Alphabet over at GEEKS OF DOOM. The review is gushing…which is ALWAYS nice…but the reviewer chooses J as her favorite poem. Which is funny, because when I first wrote the poetry for Janet’s art show, J was my favorite too. 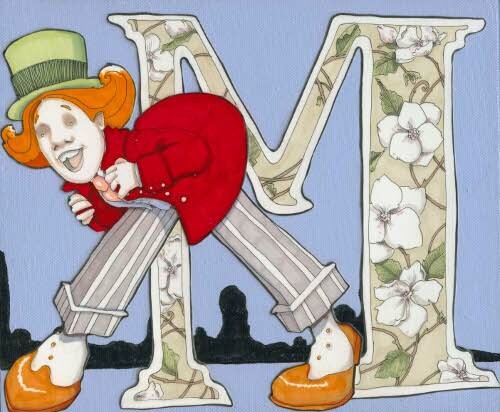 Now, I’m torn between A…and M…and all the other letters too. I don’t know if I can pick a favorite. Do you have a favorite poem from The Wonderland Alphabet ? This entry was written by Princess Alethea and posted on November 9, 2012 at 7:00 am and filed under Books, Poetry. Bookmark the permalink. Follow any comments here with the RSS feed for this post.